Flood water covers the Red Star dock and beyond Wednesday in Cape Girardeau. The Mississippi River stood at 39.6 feet on the gauge Wednesday, nearly 8 feet above flood stage. The flood-swollen Mississippi River will remain at high levels through May and put pressure on levees, a spokesman for the Army Corps of Engineers St. Louis District said Wednesday. It’s unclear what additional impact this week’s snow-packing storm across the Great Plains and Upper Midwest might have on downstream river flooding, Corps spokesman Scott Ross said. “We are all watching the water up north,” he said. That view was echoed by the National Weather Service and local emergency management officials. The Mississippi River stood at 39.6 feet on the gauge Wednesday, nearly 8 feet above flood stage, the Weather Service said. The river is forecast to fall slowly, said meteorologist Sean Poulos with the National Weather Service Office in Paducah, Kentucky. It is not expected to drop to 37 feet on the Cape Girardeau gauge until Monday, Poulos said. Cape Girardeau’s downtown floodgates remain closed. Streets in some low-lying areas of the Red Star neighborhood have been barricaded to traffic, although so far the water has not reached any homes. Cape Girardeau public works director Stan Polivick said the city has not been seriously hampered by the current flooding. But the Broadway and Themis Street floodgates likely will remain closed until April 22 or 23 at the earliest, he said. The city closed the floodgates in mid-March in the face of rising water. The city closes the Themis Street gate in the concrete levee when the river stage reaches 35 feet. When the river reaches 37 or 37.5 feet on the gauge, the Broadway gate is closed, Polivick said. Reopening the gates depends on not only the level of the river, but also when the city’s parks department can schedule flood cleanup on the walking trail along the river side of the floodwall, he said. While the city has yet to see any major flooding this spring, Polivick said he is keeping an eye on the massive storm well to the north. The storm, forecast to gain strength across the Upper Midwest and Great Plains into today, is expected to bring everything from blizzard conditions to heavy rain and high winds. Poulos, with the Weather Service, said the heavy precipitation could result in river levels rising downstream in the coming weeks. Heavy rain this weekend could worsen flooding, he said. The forecast calls for as much as 1 to 2 inches of rain in Southeast Missouri, according to Poulos. For now, flooding at Cape Girardeau is listed as moderate. The river level has to reach 42 feet on the gauge to be classified as a major flood. Cape Girardeau County emergency management director Mark Winkler said the flooding so far has not been severe. Flood buyouts over the past several decades have removed structures from flood-prone areas in Cape Girardeau and the Dutchtown area. “We really don’t have a lot of major issues,” Winkler said. “As long as we can keep it down to 42 or 43 feet (on the river gauge) we will be OK,” he said. 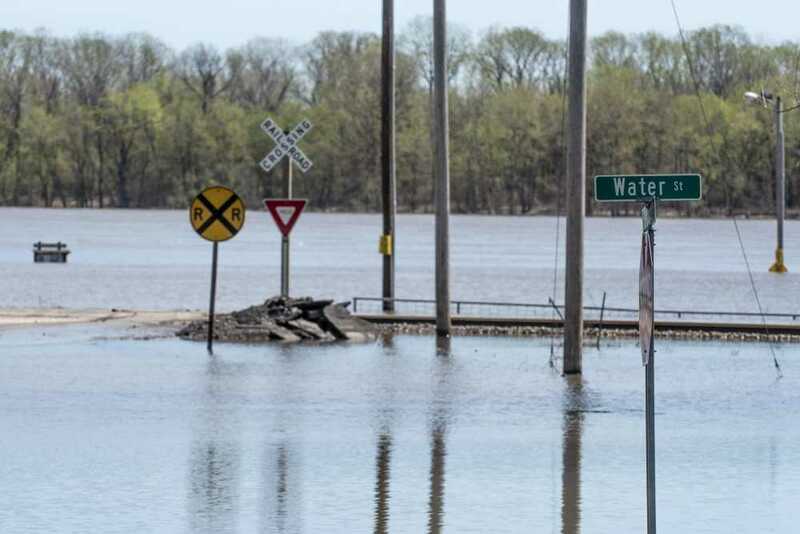 If the Mississippi River reaches 45 feet, the tiny town of Allenville becomes an island, surrounded by floodwaters from the Diversion Channel that connects to the river. The river crested at a record 48.8 feet in Cape Girardeau in January 2016. This year’s high water so far has caused only minor disruptions at the Southeast Missouri Regional Port near Scott City. Floodwaters lapped at railroad tracks running through Cape Girardeau’s Red Star neighborhood Tuesday. Sloan Creek, which empties into the Mississippi River near Isle Casino, looked like a lake because of the high water. Farther north, the Burlington Northern Santa Fe (BNSF) Railroad line was shut down near Menfro, Missouri, in Perry County because of flooding, Harbison said. But if the water levels fall, all the BNSF lines should be open by the middle of next week, he added. Southeast Missouri Regional Port operations are not seriously affected until the river reaches 42 or 43 feet on the Cape Girardeau gauge, Harbison said. Winkler, the emergency management director, said spring flooding began several weeks ago along the Mississippi River. “We all had our guard up,” he said of emergency management officials. “As far as right now, we are in good shape,” he said.